Finally I have completed the task of sorting out the bed alongside the swimming pool. After months of neglect caused by poor weather and the presence of builders, this involved hand weeding and forking all the planted areas and digging over the remaining broad band of soil, loosening up the compacted earth. This has been a tiring, but not tiresome exercise, straining muscles I expected never to use again and perhaps damaging a number of vital organs! As a reward for my efforts, I planted bear patches as I went along using, in the main, bedding plants we had grown from seed. The only major task that now remains is to sow a small L-shaped area with grass seed to create my “pelouse anglais” – my English-style lawn. Of course, in the UK I would have laid turf, but this time saving product is more or less unavailable here. Back to the gardens tour, and Saturday is a free day for our students and visitors, giving us and them a chance to recover from the excitement of the previous three days of garden visits. There are plenty of sights to see in the area and this group decided to take a train journey up the Cher to the city of Bourges. On their return, the swimming pool and one of Chantal’s regional themed evening meals awaited. Sunday was tour day four, another treat involving a drive to the area between Azay le Rideau and Tours to visit two exceptional gardens: Chateau de La Chatonnière and the Chateau de Villandry. 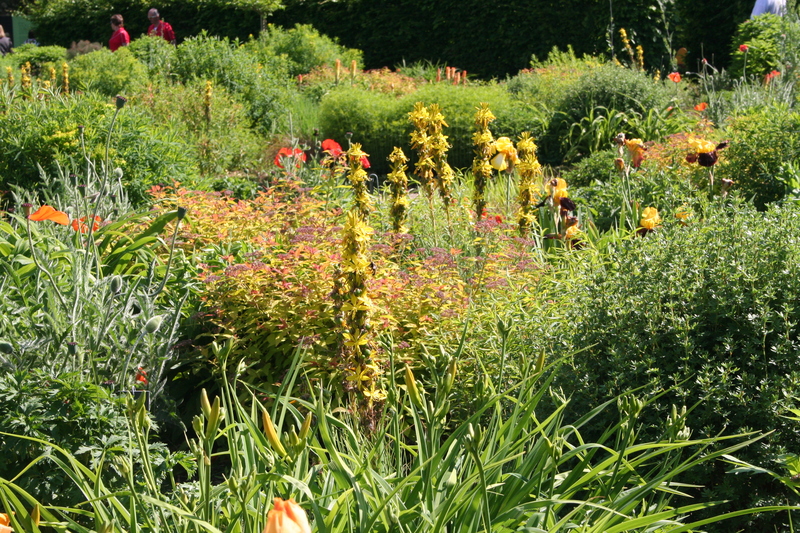 Both gardens feature ornamental vegetable planting but while La Chatonnière is, for the most part, contemporary in style, Villandry is famous for its traditional gardens. 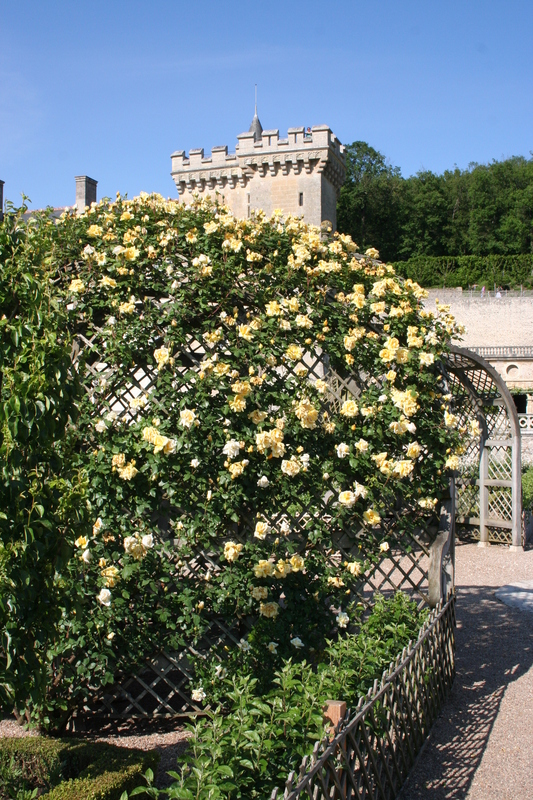 La Chatonnière was built almost single-handed by its illustrious head gardener over the last twenty years and it is still a work in progress, with an amphitheatre as his latest project. 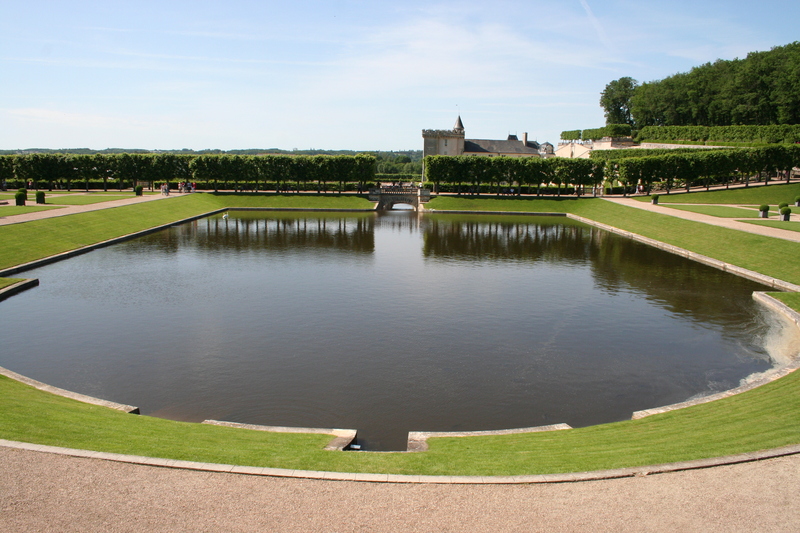 Ahmed Azéroual, who came to the chateau from Villandry, is often on hand to chat to visitors and his amazing, leaf-shaped Garden of Abundance recently won an award as the Most Beautiful Potager in France. 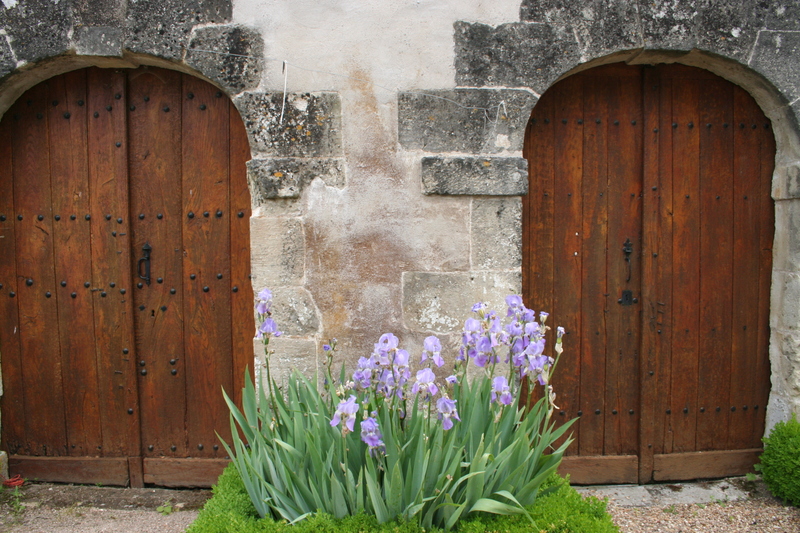 In total, twelve themed gardens have been created on the site since 1986 and with the roses, irises and Hemerocallis just coming into flower we enjoyed touring them all, before stopping off for lunch in Azay. Azay le Rideau is a touristy town and we eat touristy food – OK, but not wonderful – “correct”, as my Mother-in-Law would say. It is just a short drive from here to Villandry, with its famous renaissance chateau and even more famous gardens, at the junction of the rivers Loire and Cher. And what gardens they are! 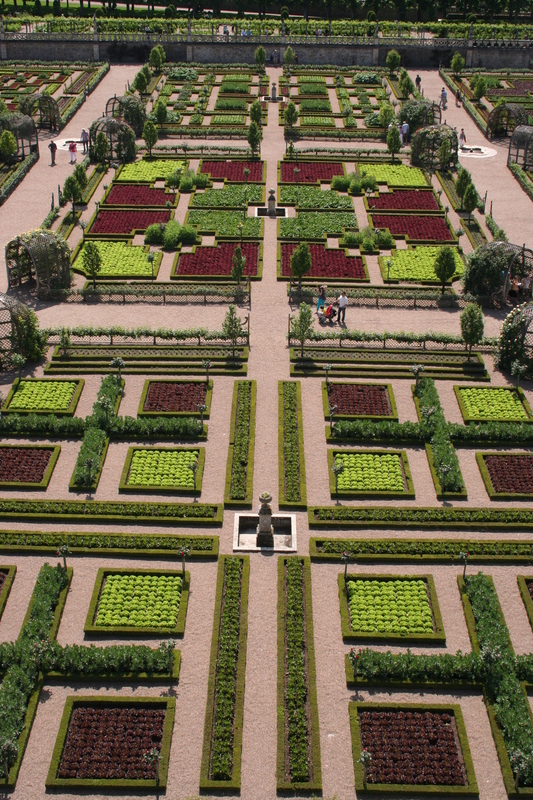 The stunning recreation of the renaissance design was undertaken between 1908 and 1918 replacing an English-style garden and park. Further areas have been landscaped since, including a herb garden in the 1970’s and the recently constructed Sun Garden. The decorative kitchen garden is a mix of colourful flowers and vegetables planted in a chequerboard plan, while the ornamental garden is composed of box hedges forming musical symbols, hearts, scrolls, butterflies, fans… allegories of love – tender, passionate, fickle and tragic. The water garden is grand and tranquil: here the pool takes centre stage, with the sound of the fountains and the great lawned spaces bringing to visitors a feeling of calm and tranquillity. This is the most peaceful garden you could find, in spite of thousands of tourists sharing it with you. 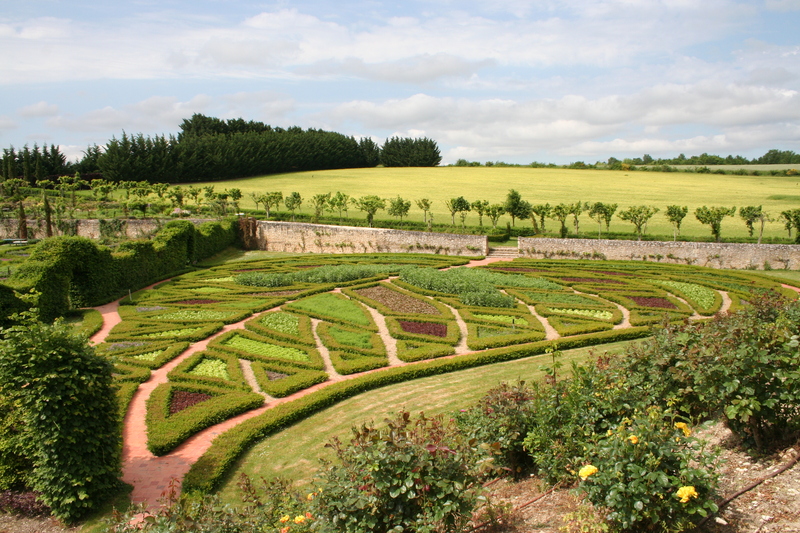 There is a herb garden, with its medicinal and culinary plants and a maze, which I didn’t visit. The new Sun Garden was excellent, divided into colour-themed parts – Sky (blue and white) and Sun (yellow and orange). The great success of these was their immense scale, allowing a very skilful designer to really achieve his idea of planting in a single colour – and all the variations of it – for a stunning, year-round effect. I have had a couple of clients over the years insisting I must not plant yellow, a curious idea that saddened rather than challenged me in my plant selection. I would have loved to show them this garden, padlocking them to the gate posts until they understood!